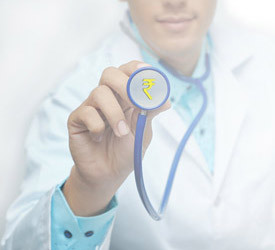 Loans For Medical Professionals - Saraswat Cooperative Bank Ltd.
For those who ease suffering, save lives and bring new life to the world, Doctor Delite is loan service honoring all doctors. For setting up a clinic, purchasing equipments or for the renovation of the clinic or hospital, this Saraswat Bank offers loan upto Rs. 500 Lakh (Fully constructed property with O.C. and copy of application for permission to run Hospital/Clinic hospital to be obtained within one year failing which penalty @1% will be applicable). Maximum up to Rs. 300 lakh – for a new medical practitioner. Maximum up to Rs. 500 lakh- for existing practitioner with minimum 3 years of practice. Only for Equipments / Renovation / Furniture upto 84 months. For applications with Min ticket size of Rs. 50 lac (premises mortgaged): Pre-sanction car loan of upto Rs. 10 lacs. Purchase of new premises/ Construction of clinic or hospital on owned plot /Renovation of clinic – Equitable Mortgage of the premises/ clinic respectively. For amounts greater than that stipulated above, 25% collateral to be obtained. Duly filled prescribed application form with KYC proof. Legal documents required for creating mortgage /Quotation of equipment to be purchased/ renovation/ furniture cost.